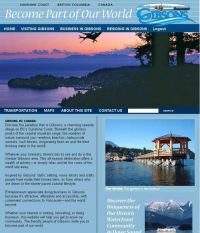 Several community groups including the Town, Economic Development groups, and Chamber of Commerce for Gibsons BC wanted to create the ultimate portal site for Gibsons. After an extensive process they selected PawPrint working as part of a team with a communications & tourism marketing consultant and Graphic Designer the complete the project. PawPrint provided all web coding and some design to create what is quickly becoming the most visible web site for Gibsons BC Canada.